The Latecoere 298 fought heroically, if futilely, against the German invasion. Designed in 1935 as a reconnaissance, bomber and torpedo aircraft, it first flew in 1936. By 1939, nearly 200 aircraft equipped four French Navy escadrilles. A thoroughly modern, all-metal, low wing monoplane crewed by 2-3 persons, it carried one torpedo, roughly 1100lbs of bombs, or three depth charges in a recess under the fuselage, between the floats. There were four main variants, all of which were almost identical externally. The main differences were whether the wings folded (they did on the Late 298B, but not the -A and -D models) and whether dual controls were fitted (Late 298 B and F). Aircraft that survived the German onslaught were used by the Vichy regime or pressed into service as trainers by the Luftwaffe, though at least one was used by the RAF on coastal anti-submarine patrols. The Vichy government ordered 30 aircraft from Breguet for use in the overseas empire (Late 298F). A fair number of all marks survived the war, and served with French naval aviation until 1951. Pend Oreille is a fairly established garage kitter specializing in obscure aircraft. I have their Su-2 in 1/48; the Laté 298 is a quantum leap ahead of that kit. Inside the box are resin, white metal and vacuform parts, along with a strip of styrene that I assume is for struts of some kind. Instructions, marking guide and waterslide decals round out the package. The resin bits are smooth and generally defect free. There are some small pits on the wings, and my props are rather bent, but other than that, everything is fine. The white resin is relatively soft and sands easily, without being overly brittle (Por-a-kast? Looks like it). Clean-up should be relatively painless. I've dry-fit the major parts (wings, fuselage and float halves), without seeing any major fit issues. Smaller parts, including sidewalls and interior bits, are cast on several resin "wafers". The parts are delicate and care will need to be exercised to keep them from breaking while being cleaned up and assembled. Detail is nice throughout, but I'll probably replace smaller bits like the rear gun barrel with scratchbuilt items (easier to work with and less fragile). Four cleanly cast white metal struts are included, plus a styrene strip for the rest of the bracing. Two thick (relatively) vacuformed canopies are provided. Their admirably clear, but molded in the closed position, so unless I cut them apart, it'll be hard to see all the detail in the cabin. 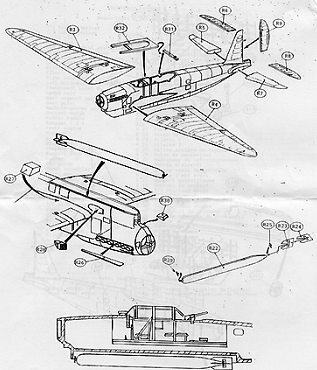 Instructions provide six pictorial assembly steps. Parts are called out by number; the numbers are listed and described on a separate page in English and French. Three view drawings are given along with a marking placement and paint guide. 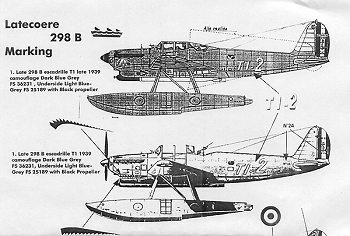 A separate sheet shows side views of three aircraft in four schemes for which decals are provided. The decals, printed by POMKals, are .... interesting. I'n not sure how they were printed (not ALPS, but not by someone like MicroScale either). They are extremely thin, and the colors are rather bright. 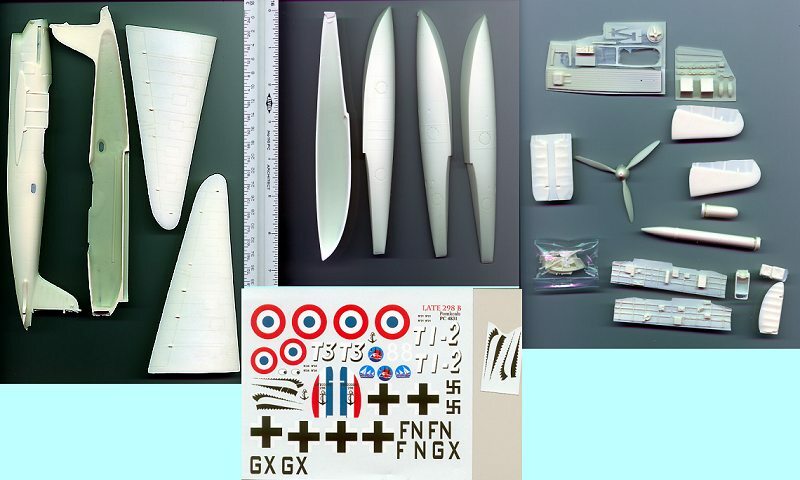 A decal provides the tri-color rudder markings of the French planes, but the modeler will have to paint the elevator stripes (good luck matching the red and blue!). When you look closely at the blue in the roundels and tail stripe, and you'll see faint lines, almost like scan lines on a TV. I'm not sure how useable they'll be .... but as they are all I have to work with, they'll have to do. Markings are provided for two French aircraft (one in two different schemes, the latter including a shark mouth) and a German plane. If I'd paid full price for this kit, I'd have been disappointed - it's certainly nice, but it's not $98 nice. Luckily, I found it on sale at the POMK website [http://pomkit.alterxp.com]. It's not for the inexperienced or faint of heart; I'd recommend it to modelers with a few resin kits under their belt.